Have you ever looked at a recipe and rolled your eyes, thinking, “Yeah, right. I’m never making that it’s way too complicated.” Welcome to the story of my life and the idea behind this blog. 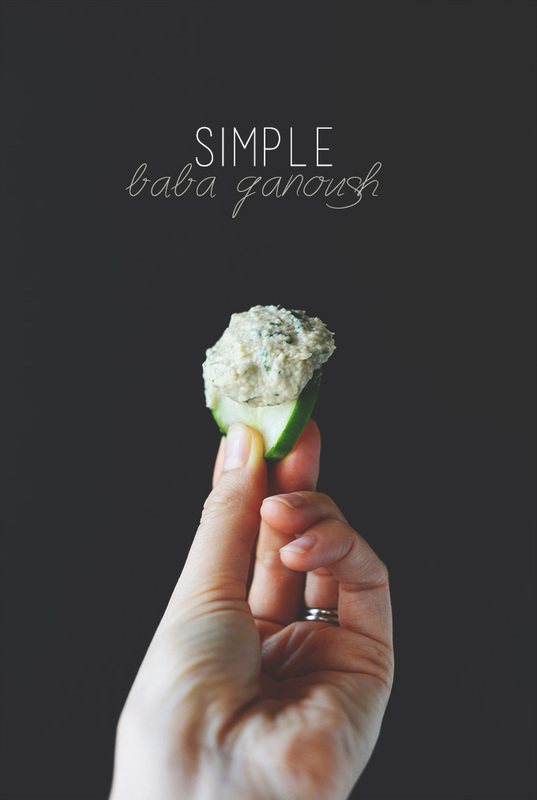 I love simplicity and figuring out new, easy ways to make delicious eats – such as baba ganoush, one of my favorite Mediterranean dishes. Baba ganoush is just basically eggplant blended up with lemon juice, tahini and sea salt. Typically you have to char the eggplant on a grill or over the flame of a gas stove. I currently do not have access to a gas stove, and while I have a grill I recognize some people don’t. My solution: Slicing the eggplant into rounds and broiling it to get that roasty, charry goodness. The result? Time and energy saved, and it’s just as delicious as the traditional method if not better. Muahahaha, I love breaking the rules. Optional: fresh herbs. Totally unnecessary but great for an extra flavor boost + more color. What’s it taste like? Uber creamy, decadent, slightly sweet and the perfect balance of savory and tangy from the lemon and tahini. It’s so lush and creamy you can hardly believe it’s vegan and doesn’t require gobs of oil. Friends, if you’ve ever had baba ganoush this version might blow you away. Try it and let me know what you think. In the meantime, I think I’ll just face plant into this entire bowl. *You can sub 3/4 of a large eggplant for the 1 medium eggplant. I don’t know if I made a mistake somewhere but all I taste is tahini and garlic. I miss the taste of the eggplant. Maybe my eggplant was too small?? Hi Arleen, that could definitely be the case! We would recommend trying with a larger eggplant next time or starting with less tahini and garlic and increasing, as needed. Hope that helps! I do mine on tin foil cut in half with olive oil and garlic rubbed on. I also add a bit of liquid smoke which really makes it tast leke the real deal. This recipe was quick, easy and delicious. I learned that I should start by adding half of my lemon juice, then more to taste (like recommended for the tahini and salt). Thanks Minimalist Baker! The final product is deeeelicious!! thank you for making this dip available to me. I was also mystified by how to make it without a grill. Now I know! Thank you. The eggplant took a while to peel after I broiled it. Then the skin came off not so easy, I ended up using a knife. Any tips? also my tahini didn’t blend well – I’m using a Ninja. Maybe a stronger blender. There were some chunks in there. Maybe tahini needs to be warmed to room temperature? I had it in the fridge. I love this site and use it quite often – the recipes are excellent! Something that would make the site more user friendly is to add a jump to recipe option. Thanks for sharing your awesomeness with us! This is so good! I can’t stop eating it… I’m so glad I just made a small portion! WOW!! This was delicious!! I made it twice now. The 1st time I followed the recipe exactly using parsley. Tasted ok, but better after it sits overnight in frig. The 2nd time, I definitely appreciated the comments a) Cut eggplant from stem to bottom, b) Definitely bake/roast in oven, because broiling it took forever, c) Cilantro instead of parsley made my taste buds pop, d) I used an electric chopper instead of food processor and it turned out great! No need for me to visit Mediterranean Cafes when I can make this at home. Thank you so much for this recipe. I made but color is so dark, I think white part of egg plant was dark after baking. This is delicious! Made it two times already. 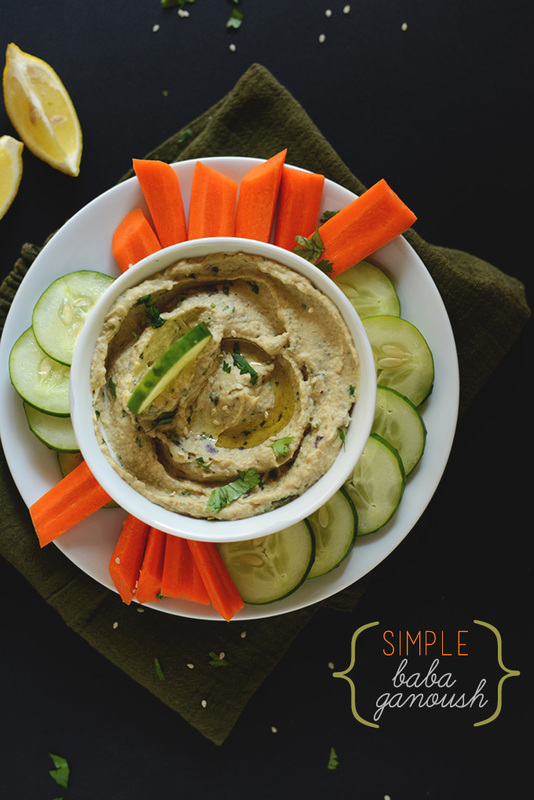 Very easy recipe for a tasty dip like this! Will make it again for sure! I used two baby eggplants and, after tasting the skin as I was peeling it, decided to just leave it on. I know, not the classic way of doing things, but it was still absolutely delicious. I added about a tablespoon each of parsley and cilantro, and a little extra tahini. Next time I will take it easier on the salt during roasting, but that was my own mistake. Thank you so much for this wonderful recipe. Great! Thanks for sharing, Mary! This is an easy and delicious recipe. A favorite dish for my brother who is very picky when trying new things. I used black beauty eggplants from my garden. My first time growing eggplants in my garden and was searching for dishes to make with the abundance of eggplants from my summer plant. This will be a standard dish for snack with added protein for balance. Thank you!!!! We are so glad you and your brother enjoyed it, Wayne! Some hikers like me took a few hundred miles to figure out what that meant. A checklist of hiking gear was only a place to start. So it is with a recipe. This is a great place to start to make that first baba ghanoush from which, if it’s not a “success”, we’ll all learn to baba our own ghanoush, whether it means more garlic, salt, lemon juice, a dash of vinegar, Liquid Smoke, etc. I bake the slices at 400 for 30 min flipping halfway through. I then store in an airtight glass container overnight and use the next day. They are very moist that way. I add a few tbs of olive oil in the food processor with all the other ingredients. I also add in cumin and a little smoked paprika. I also added the zest of half the lemon on tonight’s batch… so good. I add in about a cup of cubed fresh zucchini for extra veggies you can’t taste! Yay! Thank you for sharing your changes, Gina! This was okay but it tasted nothing like baba ganoush. Compared to real BG it was dry and flavorless. I guess I learned the hard way that the smoky flavor and moist, tender texture from grilling whole eggplants just can’t be replicated with a quick hack. This tasted more like a mediocre eggplant hummus I would not make it again as it did not meet my expectations. We are sorry to hear that this dish didn’t hit the mark for you, Deb! Better luck with the next one! Perfect recipe and perfectly delicious! I used the lemon zest in the recipe and I think I will roast a whole garlic clove on the tray with the eggplant next time to add another flavor dimension. I had grilled some eggplant slices two days ago…so I whipped this up in 5 minutes! You guys! I’m Vegan, no added oil, and this is my kind of recipe! THANKYOU SO MUCH…I used my home-made Red Lentil Tortillas for dipping…out.of.this.WORLD! My mistake for not gradually adding the amounts of the ingredients until I was satisfied with the taste, but one whole lemon was ENTIRELY too lemony – I’m thinking half of a lemon might still be too much! This was my first attempt at Baba Ganoush, and I will make it again; but this seems like a ridiculous amount of lemon. All of the hummus recipes I follow call for a lot less lemon, and I should’ve trusted my resistance to add a whole lemon for Baba Ganoush. Also I was confused (as a novice eggplant handler) why the recipe would have you add salt AGAIN after salting it the first time. I get that first time is to leach the water out but what doesn’t make sense to me is the water leaches out – only to add water back to it to rinse it! Then add salt back to it with the olive oil and then again after roasting! I left the two additional saltings out of the recipe, and the salt level was just fine. I also am glad I used TWO eggplants because had I used one it would’ve been inedible with a whole lemon. was fab just as it is! I misread one recipe (not yours) and added cilantro by mistake! Still used your recipe as the basis though and the dip was still surprisingly good with cilantro. Can this dish do no wrong? We’re glad to hear you still enjoyed it, Stef! Hi Asha! Thanks so much for the tip! I’m not sure what kind of eggplant you use, but this broiling method was a complete fail for Asian eggplant. I always cook it on a cast iron pan in slices, but decided to try something different. It didn’t cook through at all, even after two flips, and was burning the outside. I eventually gave up and cooked it the usual way. Maybe specify the type of eggplant you used in the recipe to save others the trouble I experienced. Sidenote: I always add cumin and coriander to the eggplant before cooking and it adds an excellent flavor for baba ganoush. Hmm, not sure as we’ve never tried this with Asian eggplant. Perhaps try an Italian eggplant next time! I forgot to mention that I used no oil when broiling the eggplant, and the baba did not suffer. In fact it was devoured by our guests. The broiled eggplant would be nice served as a side too. Your recipe is still delivering. I made this with the following modifications: I used 1 large eggplant, two medium garlic cloves, and half of a smallish lemon. It was absolutely perfect. My hubby said it’s the best baba ganoush he’s ever had. Yay! Glad to hear it, Kinara! This was very easy, and turned out great. I think for the recipe size the lemon I used was a little too big. Next time I’ll use half or make a bigger batch. A little extra garlic leveled it right out. Yay! Thanks for sharing your recipe additions! As promised, this was very easy and delicious! The only thing I added was a final sprinkle of cumin and smoked paprika on top of the oil drizzle. Next time I will try peeling the eggplant first, and maybe use the immersion blender instead of the Cuisenart. Thanks. We’re glad you enjoyed the recipe, June! Do you cook it in step 1? Easy, tasty, healthy. I peeled the eggplant first, broiled for 10 minutes, and skipped the tinfoil resting stage. Also added a bit of olive oil and parsley for the herbs. Will use this method from now on. I love this recipe so much. I make double and triple batches because it’s amazing and I could eat it for breakfast, lunch, and dinner. I’ve probably made this 10 times in the last 6months and it is foolproof. Thanks for demystifying baba ganoush for electric stove having apartment dwellers! It was burnt! Maybe 1/4 inch is too thin? Hmm it may have been the oven? Sometimes different ovens run a little hotter than others. Sorry to hear it burnt! What you have built here is great. My wife loves the hummus and I did a microwave version of the baba ganoush, as that is actually a very legit way to cook egg plant. I had to use liquid smoke to compensate, but still great. Thank you for the recipes, going through them little by little to treat my love with stuff she likes. I just made this…. sort of. I had no tahini, but I did have about a ¼ cup of sesame seeds, immersion blended them with a Tablespoon of olive oil and a teaspoon of melted coconut oil, added the garlic and Himalayan salt, lemon juice while the leftover eggplant, cut in two with skin on, was in the microwave for 2-3 minutes, or until really soft. Scooped out the guts of the eggplant with a spoon while holding its skin down with a fork, and added to the container, immersion blend a bit more, and Bobs your uncle, Baba Ganoush. Even faster and easier. I used your nice blog to verify my crazy idea. Thanks. I have eaten eggplant my entire life, of course being of italian/ greek heritage. My sicilian grandmother would bread and fry it.Although delish,it was quite greasy and heavy made this way. Of course Greeks made it in numerous ways,which is less unhealthy.This being said, I like the simplicity of this recipe Dana..and how much healthier for me this is. Im always looking for ways to replace my “snacky” foods which replace unhealthy snacks with healthy ones. This fit the bill. I do make hummus and now i will add your recipe to my repertoire. Thank you for posting ,and i made it and enjoyed it immensely. I’m not a fan of raw garlic, so I baked a whole bulb whil the eggplant was baking. Then I squeezed out the roasted garlic. Perfect! Thank you for this delicious, simple recipe!!! Just made this and it is wonderful. One step can be eliminated, cooking with the skin on. I made the first batch sliced with the skin on…a bit of a pain removing the skin. Second batch I simply peeled the egg plant and then sliced it, put it under the broiler…voila! No skin to take away! Just meaty slices of cooked eggplant ready to mash. Also, I simply used my Emersion blender…no fuss, no muss! It tastes amazingly like bacon! I used Braggs instead of tahini. going to try the tip of roasting whole next time though. Huh. Good recipe. I usually visit maybe half a dozen food sites like yours to come up with a consensus of general ingredients for a recipe. I stumbled on yours after I made it, and other than the inclusion of a bit of cumin powder in the one I settled on, it’s exactly like yours. I made a double batch to take to a potluck tomorrow. It might not make it that far! My results were more than perfect. Thanks for a recipe that will be my go to. No need to look further. Yum! I made this according to the recipe, adding a good bit of parsley (more than the recommended amount). Really good and very easy! The only question I have is why not peel the eggplant first? Seems easier than peeling it after the broiling. Hi! You can peel it before, but it is just easier to peel as the skin is softer afterwards! I tried this recipe using the abundant eggplant from this year’s garden. I had hopes for a quicker method to make this dip, but alas, the quality really suffered. I used my gas oven broiler. By the time the eggplant was cooked, it had dried out and blackened in several places. This made for a dark, chunky, rather unappetizing looking dip. In addition, it was quite bitter. I served it to some people who are not particularly food adventurous, with predictable negative results. I will go back to my old tried and true recipe which really doesn’t take any more effort, just more time. My husband and I aren’t crazy about the flavor of tahini, do you think Almond butter would be a possible substitute? Yes, that should work Sarah! Just made this and it came out just as I had hoped.. actually even better. Thank you for this simple delicious recipe. Is there any objection to peeling the eggplant before slicing and roasting? Hi! You can, it just makes the skin come off easier once its roasted! I add a bit of Sadaf’s 7-spice. The DirecTV guy was at my house then my friend Rafi called…”Hello, Rafi……”. I hang up later and the repair guy says ” my name is Rafi, too!” Said he saw I was roasting an eggplant on gas burner. Asked me what I was making and I said Baba Ganoush. How do you make it?…. I make all my own food at home w mother! Said I must use Sadaf’s 7-spice! I think it’s the sumac that lends its flavor although not listed! I have first tried baba ganoush in a Lebanon restaurant and it was beyond delicious, drizzled with olive oil and garnished with pomegranate seeds. I’m kinda disappointed with how my dish turned out, it is quite bitter and I can’t seem to fix it with salt or tahini. Not really sure if I added too much lemon or I bought a bad quality eggplant … Nevertheless, thumbs up to your blog Dana! Hi there! I’d like to give this recipe a try but I don’t have a food processor. Any you could recommend? What food processor do you use? Hi Gabriele! This one is what we use! This recipe failed to produce an acceptable dish. Recipe is missing olive oil and was stiff and not smooth. Lemon juice is too much, making it too tart and tangy. Also, too many eggplant steps. Not simple or quick. Add more tahini to balance the lemon, and EVOO if you’d like to thin it out – just taste and adjust before you’re done, as is always suggested with these recipes. Delicious! I made the recipe exactly as written and it turned out ridiculously good. Thank you for sharing the recipe! This looks great! I have always wanted to make this dip at home. Unfortunately my husband is allergic to sesame. 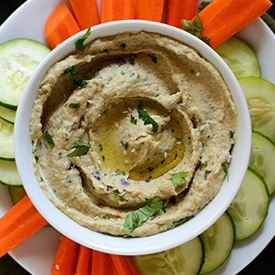 Do you have any recommendations for substituting tahini? Thanks! I was afraid that my eggplants will be bitter, so instead of roasting it on the gas stove top to get the smoky flavor, as many recipes suggest, I decided to follow this broiling recipe instead. The result, it took me way to much time. It definitely takes longer than 15 min to prep. Just to salt eggplants and let them sit takes 30 min to prevent bitterness. There is no way of knowing before they are cooked so I’m not taking any chances. Than the broiling part. I made slices about 1/2 inch and figured that it will take 20 min to broil. It’s took me about 40 min and my oven keep broiling eggplants close to the flame but the side slices were still not fully cooked. It was my fist time using broiler, but I feel like I’m better off baking them next time sliced in half. Will be definitely less work, especially pealing that skin, from each individual slice, thank God I make them thicker than the recipe suggested. So I can’t find this recipe easy at all, I was exhausted when I was finally done. I’m glad if it worked better for other people. As for the taste. I changed proportions to 3 medium eggplants, 3 roasted garlics, 1/2 cup tahini, 2 lemons, some salt and a bit black papper. It was so delicious! Was my first time making BABA GANOUSH. :) Was very glad I made a lot of it, about 1L total. I like to cook ones a week and don’t bother the rest of the week. Also having more lemon would be too much for my taste. Thanks for this easy simple recipe! I just started the whole30 challenge and have been looking for something healthy to make my large consumption of veggies more appealing. So wonderful and creamy!! This is so easy and absolutely delicious, and eggplant is not my favourite vegetable! Thanks for a recipe I will be using regularly. Having eaten my fair share of authentic baba I had my doubt about this but I made it as written and it came out excellent! I’m making another batch tonight. I changed it up a bit and it came out tasty. I didn’t bother with the salt/water extraction process. I peeled the eggplant first, cut it into rounds and then toasted it as required. OK, I make an even simpler gaba G. I use a knife to puncture the skin of the eggplant and put it into the microwave. I also do not use a food processor, I just beat up the result with a spoon … I actually prefer the lumpy consistency. I like garlic so I am also a bit heavier on that. Truth be told I start adding the other ingredients gradually and keep tasting. I typically put a small amount in a separate small bowl and add a bit more of what I think it needs and taste; if it is better the whole lot gets the change. It turned out amazing, but one question. The salting process takes some time. What would happen if you just cut the eggplant up and broiled it without salting? It would be fine, but just a little more liquidy, and the dip may have more bitterness – that’s what the salt helps draw out. IS it ok if I don’t have tahini? We haven’t tried this recipe without tahini so I’m not sure how it will turn out! Although it’s only a couple tablespoons, I think it really helps with the flavor profile! I would suggest picking up some tahini or make it yourself! It’s such a great item to have on hand to top roasted vegetables, salads, or even could be used in desserts! My daughter is allergic to sesame and nuts. What do you suggest as an alternative? first time I’ve ever made this, hubby loved it from restaurant, but I over broiled a bit, wasen’t sure what size was medium for eggplant, mine was from my garden. and WAY too much tahini. maybe add one tbsp, and add more if needed. was the consistancy of thick peanut butter. Also that’s too much tahini. For 2 pounds of eggplant I would use about 1.5 TBS. Matter of taste but the flavor of the eggplant needs to shine through. Interesting idea. Might give it a try for comparison. I fire roast mine on my gas stove on medium high then finish in the oven at 450. Gives it a deep smoky flavor. I do not recommend food processor or blender. Save that for when you make humus. For baba you use two spoons to work the flesh and do not overwork. Should be chunky to be the real deal. Awesome recipe, simple, easy, damn delicious…YUM! Thanks for a esay but delicious receipe. Made it and my family loved it. Thank you so much for this great recipe that only uses 1 eggplant! It is just the right size recipe for me! I have noticed that many people do not keep the skin in the dip. It looks a lot more inviting without the skin. But I have left the skin on, or a lot of it when I’ve been too lazy to remove it and the finished dip still tastes good, it just looks ugly. lol. I did not use foil. I piled the broiled eggplant slices in a glass bowl and covered it with a ceramic plate. That worked just fine. love your philosophy and here’s the thing…………. love cooking but I do not always have the time and all the ingredients…..just make it with what you have. It is almost always real good and once you get a knack for it start rounding up the extra items to make it a traditional way. You still get to eat the thing, it’s delicious, one can make it again and you already got to try it and had fun cooking it. Perfection does not work for me and I rather have it than not have it–even if its not perfect. think about it–how bad is egg plant and onion and garlic and olive oil going to be? I tried this idea with Chana Masala and hummus–they were still delicious but I know there is room for improvement. I know some baking has to be exact but the ones here lend themselves well to your idea–love it. It’s me. 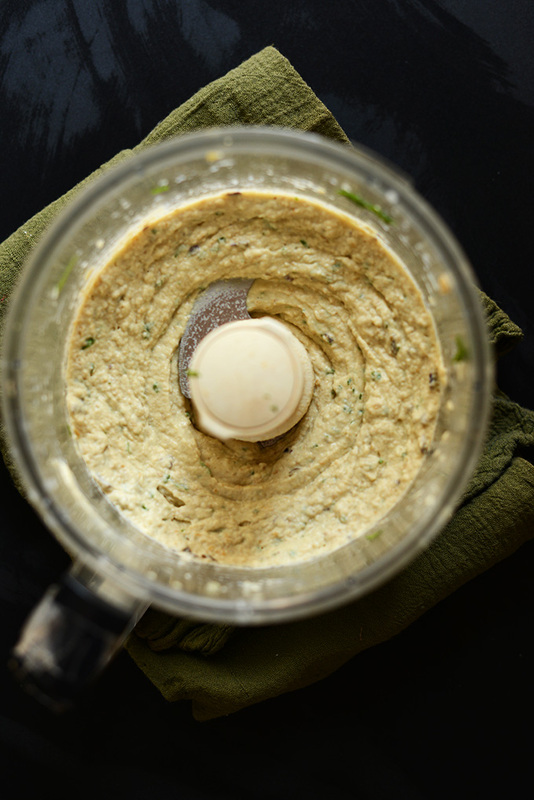 in the recipe you wanted to link to how to make Tahini but linked to hummus. Made this last night and woah! so good. My fiance and I had tried baba ganoush at a local eatery and I knew I had to attempt to recreate it at home! Minimalist Baker is my go to for recipes so you can imagine my excitement when I found this one! I may or may not have doubled the garlic…STILL SO GOOD BUT ME OH MY OH DO NOT EAT BEFORE YOU GO ON A FIRST DATE. Or do! Whatever you’re into hahaha. I’ll go easier on the garlic next time, on the plus side – no vampires to be seen. Awesome easy recipe. This is a recipe of mutabbal and not baba ghanoush. I have made this three times now, usually in large batches because my 1-year-old loves it. However, it take close to two hours every single time. I’ve tried this twice. The first time I made a single recipe – forgot to rinse the eggplant after salting it and letting it rest, and already had the olive oil on it, so I decided to pray and proceed. The result tasted great, but I had a heck of a time removing the peel and it took forever. Since it was such a small amount, I tried to make it in my single-serving (Ninja IQ) smoothie blender, but it seemed too thick. It kept getting stuck in the cup and I had to keep stopping it to stir it with a spatula. The second time I made it, I decided to make a double recipe so that I could have some leftovers. I also made it the night before an afternoon get-together. Contrary to the comments, I thought it tasted wonderful when I served it the next day, and now it is three days later and still Delicious. This time I sliced the eggplant in half lengthwise and cooked it on the gas barbecue. It only took a little bit longer than broiling the thin slices. I let it rest a long time in the foil and a lot of juices came out. This time it separated very easily from the skin, so overall time was considerably less. I didn’t add all of the juices to the food processor. I thought the taste of the second batch was better, probably because I used larger eggplants which better balanced the lemon, and perhaps it was the BBQ method. The food processor didn’t chop up the seeds as well as my blender, but I didn’t think that detracted from it one bit! Roasting the eggplant like that makes it taste like garbage… too smokey of a taste. Poke holes in the whole eggplant with a fork, then roast it like that. Cool, and then scrape the insides, minus the seeds. Trust me. Thanks for encouraging the confidence to make this! I had fun and it turned out super yummy. Yessss!!! Score. Sigh! Mine was yucky. What did I do wrong? I even snipped off a little of each slice to check for bitterness and then it tasted bitter at the end. I’m a newbie to this way of cooking so I’m sure it is operator error, but it looked simple. What do you recommend as the starter section for the total newbie? It’s pretty disheartening to try and eat better and then do it so poorly. Dana, the eggplant skin didn’t separate well – may be the eggplant slices were a little too thick, or the eggplant age or variety doesn’t separate as well. I spent alot of time cutting peels, even with increased cook time, although they were edible. Still tastes great, and it won’t last long. But I may go back to roasting the whole eggplant as I’ve had better luck with the peels that way. I made this the other night for friends, and it was a big hit! I even forgot to peel the skin off the eggplant, and it turned out just fine. I really don’t think you can ruin this recipe. It took all of 15 minutes, which was great because I was also making lasagna. I will try roasting the egg plant whole over a gas flame, rotating for about 2 minutes till the skin is nice & burnt. Halve the egg plant & place in a 200 degree centigrade, fan forced oven for 20 minutes. Remove, cool & with a spoon take out the flesh. Add the ingredients as suggested earlier & blend.Place in a serving dish adding a bit of chillie pepper on top & dress with olive oil to cover. I have tried this in the Middle East & Saudi Arabia, & it works good. Great tips! Let me know how it goes! Why can’t I peel the skin before roasting the eggplant? You can, but it’s just easier after roasting. Made a batch and a half in one go. It was my first attempt, I’m a big BG fan but rarely get it as I don’t have a restaurant-level entertainment budget. Really pleased with this, I will be making this again. Thank you so much for sharing this! It turned out awesome and so creamy!!! Awesome recipe!! Easy to follow and came out DELICIOUS! I thought baba ganooj had yogurt, but this recipe proves no need! I had an issue.. After I cooked the eggplant, when I pulled the skin off it took a bunch of flesh with it.. Realizing peeling would take 45 minutes, I decided to forgo it entirely – and with little to no compromise in texture or appearance! I found if you cut the eggplant into spears it is easier scrape the flesh from the skin with a spoon. Remove the seeds after baking them. The ones I made with the seeds in came out not so good, but the one I made without came out great. Thanks for the recipe! I think all recipes should be short and simple!!!!!! I did however find a way of eating the (super healthy) seeds. Wonderful and easy recipe, thank you very much. I tweaked it just a smidge for me. Made this for myself last weekend as I was missing the taste of home and don’t have a gas stove. I ate half of it before I added the tahin, with just fresh parsley tomatoes and some salt. Was amazing ! Thank you so much for this delicious recipe and your beautiful website. So great! Thanks for sharing, Karina! I love your time and effort saving techniques, thanks for sharing your tricks. As a busy medical student but also serious foodie, I appreciate your blog a lot! Have you ever tried drizzling plain yogurt in baba ganoush? I had a very similar eggplant dip at a Afghan restaurant the other day and they had yogurt drizzled on top and it was amazing!! Sounds amazing! Will have to try a dairy-free yogurt next time. Just made this and it is easy, simple and very yummy.. No need for a food processer… normal blender work well. Its is difficult to imagine that the author has actually made this recipe. 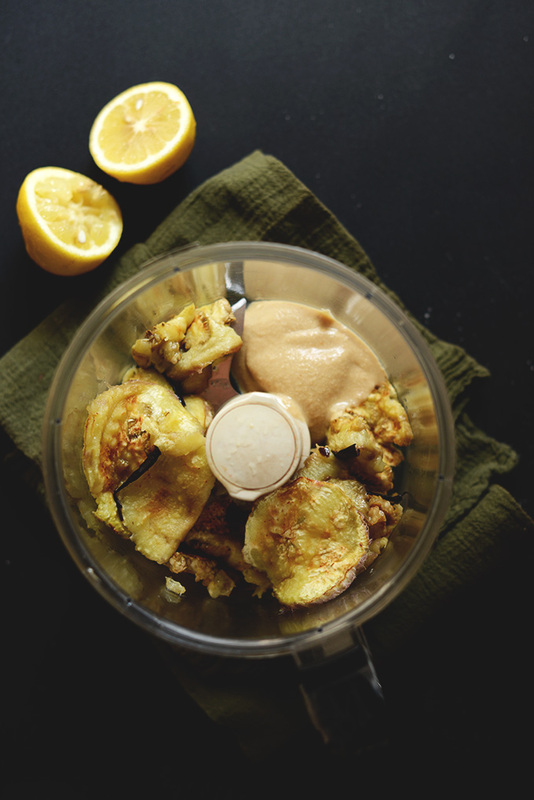 Here is what didn’t work… 1) Making 2 tbsp of tahini in a food processor isn’t possible. There isn’t enough ingredients to reach the blades. 2) Roasting the eggplant without peeling it requires that you spend 20 minutes trying to peel roasted eggplant. Not a time saving idea!! 3) Roasting the eggplant slices until golden brown doesn’t take 5-10 minutes under the broiler… it takes 20 minutes. 4) This recipe makes about 3/4 of a cup of baba ganoush… again too little to make in a food processor. Finally, after investing 1 hr and 15 minutes (not the 25 minutes indicated) 5) the final product tasted like lemon juice and tahini. Hard to believe you made this recipe based on your comments. My broiled eggplant took four minutes, peeling the roasted eggplant was super easy. Mine made a large amount and is delicious… added a little extra tahini, lemon juice, and plenty of basil. Huh? Laurie, you were to use 2Tbs of tahini in the recipe, not attempt to create 2Tbs tahini in your food processor. You don’t need to peel roasted eggplant, just scoop the cooked insides out – done in a flash. 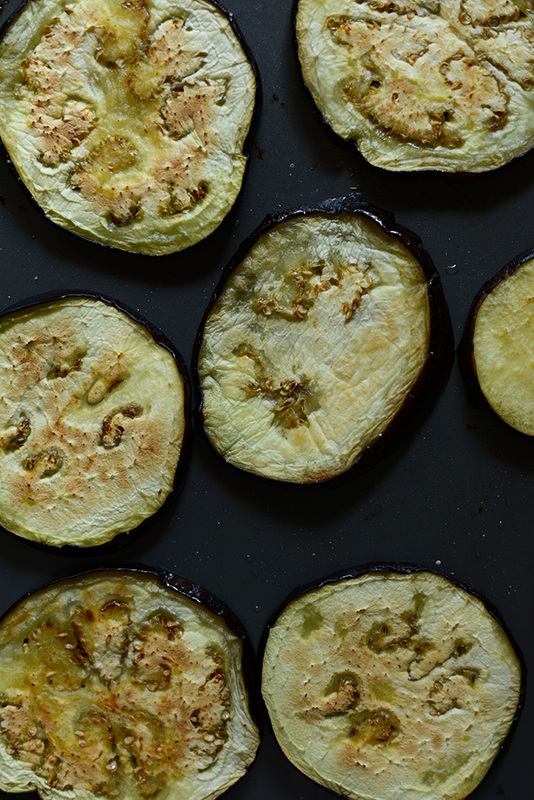 You might want to roast your eggplant whole next time, or use more oil on your slices if yours dried out. Laurie, huh? Recipe calls for 2 T tahini…it doesn’t say use your food processor to make 2 T tahini. Cooked eggplant can be scooped out of its skin in no time. If yours is drying out, try roasting it whole instead of sliced. I’ve made tons of Dana’s recipes and have not had a single fail. Was your broiler on low? I would think 20 mins under the broiler would char it to a crisp. It was simple and delicious the only change I made was adding extra garlic because you can’t ever have too much garlic. Thanks! Will be using this recipe for sure. Just a word of caution though, you say the recipe is gluten free but recommend pita chips and bread, which are NOT gluten free. Someone new to gluten free might be confused. This could be harmful to someone on a medically necessary gluten free diet (like myself). You could absolutely eat gluten free bread or pita :) I would imagine someone who is celiac would know not to eat glutinous bread, but do eat gluten free bread. 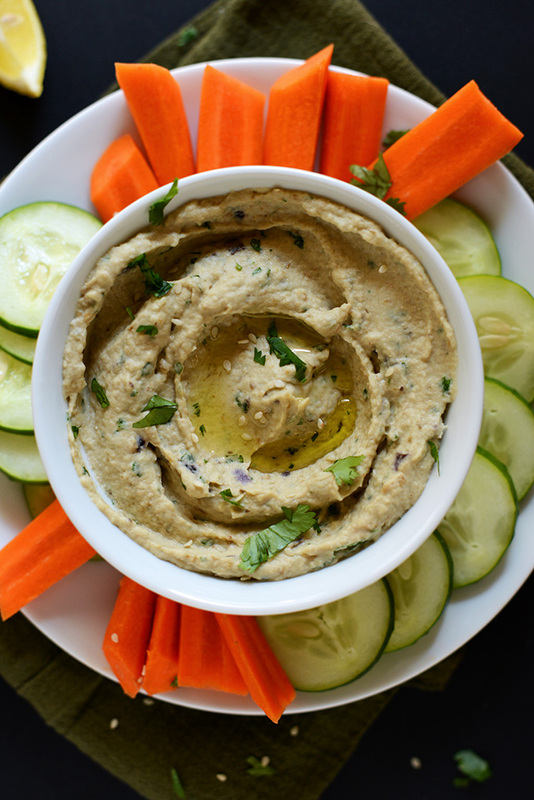 I had never tried this eggplant dip before and as far as vegan dips go…I prefer hummus but I had a crazy idea to mix some of this dip into some vegan potato and spinach curry and it was AMAZING. :) I think it makes a good dip and an especially great garnish! Making this again tomorrow for a vegetarian potluck. I do not take any of the skin off the eggplant. This is such a wonderful recipe. Thank you so much for sharing it! This was really good, though I felt there was too much lemon, it almost overpowered everything else. But I’ve been wanting some baba ganoush and have a bunch of eggplants coming on in my garden, so this was great! This was FANTASTIC and so great with my clean eating! The classic eggplant (most common variety in North American grocery stores) retains a lot of water and bitterness, hence the need to salt it. I’ve found that Indian eggplants (also purple, but round, between the size of a golf ball and a tennis ball) and Chinese eggplants (purple skin, shaped like a cucumber) are less bitter and therefore don’t need salted. While this may slightly change the authenticity and flavor of the baba ganoush, it’s a shortcut you can take if you don’t have time to sweat the eggplant beforehand. This was my first time making baba ganoush and it was so easy and delicious. We finished it off in one sitting! I love that there’s no additional oil! Lovely! So glad you enjoyed it. Thanks for sharing, Ari! Glad you enjoyed it, Sophia! I agree, I just added a bit more tahini and it toned down the lemon. I think the lemon I had happened to be extra juicy. Lately every recipe I see and want to make requires a food processor. Would this work in a blender? Has anyone tried? It would, though it may be a bit chunkier, depending on your blender. Hope that helps! When I learned to make this from an Iraqi she added three ice cubes in with the eggplant to help smooth during blending. I bet that would do the trick in ablender, just like with fruit smoothies. Yes! In Vitamix it worked great and tasted delicious! Okay, seriously… This recipe rocks!!! We’re supposed to be doing only smoothies and juicing right now, but I had this lonely eggplant in the fridge. I couldn’t let it go to waste, right? I can justify anything in the face of being wasteful! Bwahahaha! Total winner! I can’t wait to have another stray and lonely eggplant sitting in my fridge! Thanks! Stacy we are in the same boat. We are attempting to juice and I had this one eggplant so I am making this recipe as we speak and it smells good right now. Can’t wait to taste. Yum!!! Ieven made this in a bullet and it still gets thumbs up. Nice. I use a whole lot more garlic and roast it with the eggplant for 20 minutes. Also add cumin, chili powder, and hot sauce. Wow! What a tasty, simple recipe. I just ate baba ganoush but it’d be ideal to make it myself. I see you are a sophisticated foodie, and may I add in addition, a very clever wordsmith. If you had been raised by normal parents obviously you would have come out differently but..
Oh I’m super excited to try this. I just added eggplant to my farmers market shopping list. Update: I made this yesterday. It’s soooo good! Thanks for all of the steps, I think they made a positive difference in the tastiness factor. I’ve never made baba ganoush before but I’m pretty proficient at hummus recipes. I’m officially a baba ganoush convert now, especially since I can make my own without any parsley (probably the only herb I don’t like). Thanks again! Try dill and some mint! It’s delicious. We’ve only ever made baba ganoush in the oven under the broiler. It’s the only eggplant dish that Chris really loves. Bana Ga, what!? I can’t wait to put my end of summer eggplant to work in this! I totally judge recipes by how much work/time they’ll take. This sounds amazing — love the simple solution to broil the eggplant. Definitely making this. Yum! I’ve never made it because I totally roll my eyes at all the steps. You’ve sold me! I’ve gotta try this one! Just made this! Yum! I always prepare eggplant like this because it keeps the eggplant deliciously soft but thinner slices get a little crunchy, which I love. I used 2/3 of a huge eggplant but next time I’ll use the whole thing because the tahini was a little strong. I added a bit of paprika and a ton of parsley and fresh ground pepper on top. Thanks! Love, love baba ganoush. this does look like a great recipe to have on hand. Thanks for simplifying Baba Ganoush. I was just enjoying some yesterday and thinking “I wish this was easier to make”. Now it looks like I may have been wrong. Yummy! I absolutely love baba ganoush but always broil them whole – you version saves so much time. I love baba ghanoush and after seeing this post, I just realized that I haven’t had it for a while! I’ll have to try it tonight! How about using it as a topping for baked fish? I can’t remember the last time I bought an egglplant. I think it’s because no one in my family will eat it. But this seems like one of those “sneaky” recipes where I can get them to eat it because it doesn’t look like eggplant :). Umm what leftovers. I have now made this twice and eaten the whole lot by myself in one sitting – is that bad? Haha, NO! I don’t think so. But then again, I’m a total dessert fiend. Thanks for the comment Kate! I was thinking the same thing! Leftover baba? No such thing. We have loads of eggplant from the garden, in the past I’ve put the Baba Ganoush in jars and preserved them. When I made it I slow roasted whole aubergine and it took forever! I am going to have have to try slicing it to cook it looks so much easier! thanks for the tip! I have never had baba ganoush, but I love eggplant! so I am thinking I would love this! It looks like it would be the perfect healthy snack! I don’t like eggplant and love Baba Ganoush. So much, I now grow eggplant. You can’t beat fresh from the garden! I love that your recipes are so simple – it’s the best!! Plus you always post awesome recipes like this…totally trying it! It’s easier if you don’t slice and broil the eggplant(s). Simply pierce, rub them with olive oil, and roast at 350 for approx 40 minutes — until soft. Thank you for the tip LP. Doing it now. 3 things: cook the aubergines on open fire untill the skin is carbonized. In fact, the vegetable is auto-boiled while keeping the unique “burned” taste. Next, you need to get rid of the seeds which can spoil the taste by their bitterness. Finally, be demanding on the quality of the tahina. That must be why mine turned out so bitter! I included the seeds… I also made my own tahini out of some preroasted sesame seeds I bought in China…. I don’t think they were fresh enough. Mine was so bitter it was inedible! Try, try again. How do you get rid of the seeds? It seems impossible. I like to cook my eggplants on the BBQ with the skin on as well. The taste is amazing compare to cooking them in the oven. Love, love eggplants anyway or shape. I usually just cut mine in half, pierce the skin, rub the cut side with olive oil and roast on a baking sheet (on tinfoil for easier cleanup) with the cut sides down. Then after they’ve come out of the oven and cooled slightly, I scrape out the pulp and put into a colander to drain a while before making the baba ganoush. That’s an interesting comment about the seeds. I’ve never gotten rid of them and haven’t noticed mine being bitter. Clarification, cut mine the long way – stem to fat bottom (not the short way across). I made the recipe as listed. Yum Baba Ganoush. Next time I will roast the whole egg plant though – slicing and broiling was a little too hands on for me. But great recipe overall! This is how my mother made baba ganousch – only we called bakla-zhun. She also used minimal ingredients (eggplant, lemon juice, salt, olive oil). No grilling – just baking (minimal oil) or steaming in skin; removal of skin when “cooked” & mashing with lemon juice, salt (mild herbs & minimum oil). She did not discard seeds – adds to flavour & is probably good for health! Simple! I agree. I followed this recipe but remember doing it the other way a previous time and it was much easier as the 10 minutes on broil was not enough on high broil for me. They were not fully cooked so I had to do the second round on broil. Next time I’m baking on 350 again.